Before bread making, (BBM) I had a dog, in fact two, but I didn’t bake. I had one recipe for liver cake which the dog trainer gave me which I made, froze and doled out for reward based training. Apart from that the dogs had cheese squares, bits of sausage, toast, the less disgusting dog chews, dried fish bits, dried ostrich bits, dried tripe. The usual sort of stuff a spoilt western dog gets given. It’s a huge industry – pet food. If you worry about the origins of your own food, don’t keep a pet unless you are prepared to start fretting about where their food comes from too. The ‘pet food’ industry is a murky place. I work on the principle that if it is pink and tastes of sugar and synthetic bacon it is probably not something I want my dog to eat. Dog tooth decay is endemic and dogs smell bad a lot of the time because of it. Really they don’t need treats at all, any more than we need chocolate brownies! Then, the first time I made bread sticks, the dogs became very interested and for a while I experimented with variations on the bread stick theme…but the dogs were trained by the time they were about a year old and didn’t need so many exotic treats to get them to do what they should be doing… I made the odd batch of liver cake, but it wasn’t really needed. Then we discovered that the supermarkets did small boxes of cocktail sausages and lazily we moved on to those for those days when the dogs needed some little something extra or were being looked after by someone else who needed a hand. 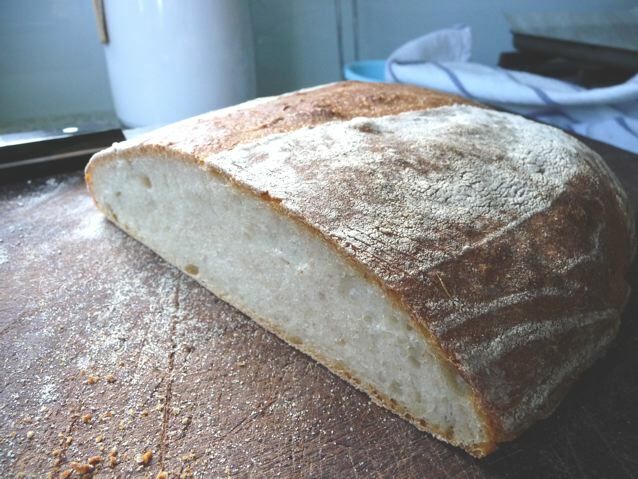 So being the dog’s birthday and all, what the hell, make him some sourdough treats, he eats enough bits of toast… he knows what it tastes like. If he doesn’t eat them I will offer them around with some taramasalata. Do a taste test. Yes, they’re acceptable to everyone. This is a crazy world. We shouldn’t be baking for our dogs. On the other hand if you see the rubbish or dare to taste the stuff that the pet food industry wants you to give your dogs as treats, you would consider doing the same. Given that I have a pair of dogs in my home, the deal is they give me eternal love, I give them food, a walk a day, a warm bed and just once in a while – sourdough chicken biscuits. 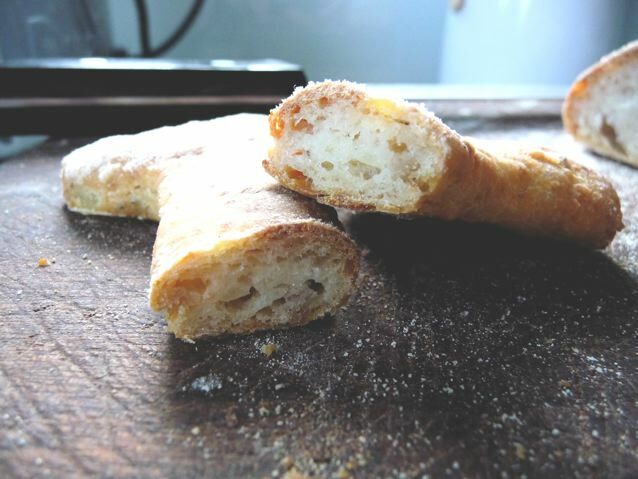 This entry was posted in Pandering to Poodles, Poodles, Recipes and tagged pandering to poodles, sourdough chicken dog treats on 17/08/2010 by Joanna. Now interesting you talk of the murky depths of the dog food industry, not being a pet owner, I hadn’t really thought about it. But ‘duh’ of course its going to have the same problems of people food. Thanks for the prompt. Organic chicken, potato, egg and sourdough should all be ok but parmesan – don’t know if you can give that to babies? But there’s no other added salt. Dont say I didnt warn you! I knew someone would say something like that :) On opposable thumbs, that’s my line, see the about page ! Thinking about your comment… we used to do the raw thing, almost killed Zeb with gastro enteritis, suits some dogs not all. He gets offal in the form of dried bits of animals usually. Mostly tripe. *sigh*…I often wonder how the world got to this stage? I remember a while ago a lot of chinese babies getting incredibly sick from melamine in their infant formula. I guess you are being rhetorical here :) It’s mostly a numbers thing, isn’t it? Billions of us on this planet all wanting stuff that the planet can’t give us, so we ‘engineer’ solutions that cause further problems and so on…. the wolfie labradoodles – I know the ones you mean – maybe the ur-dog wasn’t a wolf but a doodle. 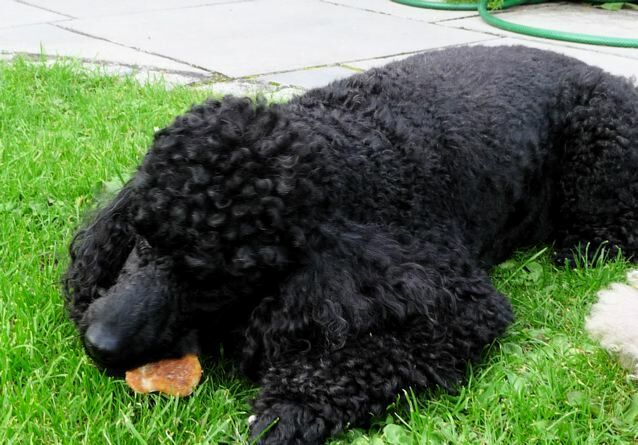 A Weredoodle in London, Dances with Doodles, Never Cry Doodle, Company of Doodles, Doodlehearts Revenge, Eye of the Doodle…..
Lucky Zeb – he looks as if he’s enjoying his treat! My niece had a dog I loved deeply- and for his birthday I made doggy bread treats- whole wheat bread with extra dried milk and dipped in gravy and rebaked at the end. He loved them and me. Thanks for sharing- it was nice to remember Rocky. Your treats sound lovely Heidi. Rocky must have been a loving dog. A wise friend of mine said that the loss of a beloved animal leaves a different shaped hole in space and time, and without becoming mawkish and sentimental I think I know what he meant. Thank you for your memories. 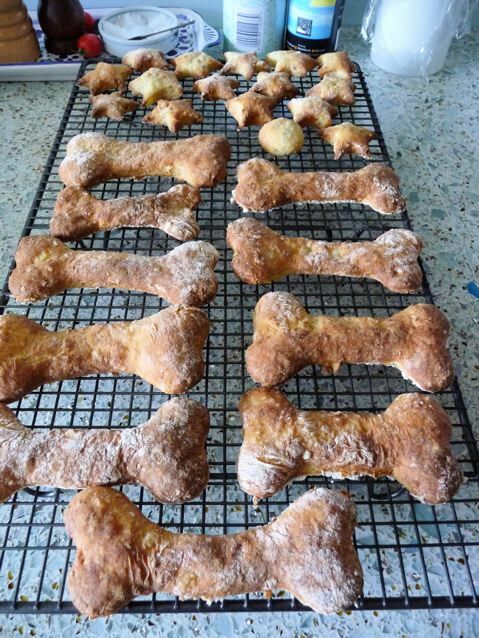 What lucky dogs you have to bake them delicious looking treats! How long does a ‘bone’ keep Zeb going for? I KNEW you would be making some dog cookies!!!!! They’ve gone a bit soft; I think for really hard crunchy biscuits I should have turned the oven down and left them in there for another half an hour…. most of them have gone in the freezer for now, to be doled out at a later date. I loved this post and the post with the garden photos and description of the Robin. I named my youngest daughter Robin purely because I loved these little birds. As for lucky Zeb, a friend once said, if there was reincarnation, he wanted to come back as one of our dogs, but I do know the mental conflict of lavishing love on my dog and considering what life if like for those in the world who scavenge for food. Have you seen the movie/documentary ‘Food Inc’? It’s very disturbing and I wonder if such information doesn’t make one want to shut out such knowledge and bury oneself in ones own little sphere albeit living as ethically as possible. Your blog is part of my little sphere. Ok it is a good thing our dog is not sitting in the office with me today (sunning herself out on the back step instead)….or she would have really gotten a few ideas and raised expectations! I love the dog bone shapes….and that very healthy looking dog happily munching away on those treats. A year later almost Spice and I just peeked at this post and realised I never said thanks for commenting…. He’s pretty healthy most of the time, though is developing a fondness for corners of sponge cake, tsk tsk tsk. I might start replacing Molly’s Frolic with these. I’ve added a dog bone biscuit cutter to me scavenger list. I was asked if I could make a dog’s birthday cake the other day by some friends who have a dog walking business. I looked up dog’s birthday cakes to see what was on offer on the internet, I was quite surprised to see full on sponge cakes with some sort of non chocolate ‘chocolate’ icing. I don’t think I’m going down that line. Though, I did pick up a tub of chicken hearts at Sheepdrove (organic butchers) the other day for next to nothing, and I might make him kebabs with those for a birthday treat this year…. Zeb unfortunately has a taste for sugar and a general interest in cake (following an incident with a tray of lebkuchen and other goodies left on a low table at Christmas a few years ago). He has never sampled chocolate but he can smell the sugar content and so will look vaguely hopeful if there is chocolate around. He doesn’t get it though, ever. Christmas seems to be a time when dogs get to sample goodies. Molly ate a block of butter from the coffee table. We grabbed the bread and cheese before she finish that off, too. We were cross with yourselves for be so silly as to tempt her, setting it right within reach, and Molly was oblivious; she just smiled and licked her lips. Her nose (and mouth) are exactly the height of the coffee table, so I can’t really blame her. She’s a dog after all. I once sat at a cafe with a blind woman and her dog. The dog, she said was never ever fed by hand, only ever got food in its bowl and therefore did not entertain the possibility that she might be given food from the table or from a person. The dog sat there peacefully while she ate and watched the passersby, didn’t look at her sausage sandwich once. Maybe she realised there was no point in looking as her owner was blind and wouldn’t be able to make eye contact with her and ask for the food using the ‘directed glance’ that dogs use so effectively with people. I was very envious. But as they teach us to train our pets using food as a motivator I wonder how that dog was trained to do everything it could do so competently, clickers maybe? I know a woman who takes on puppies for the hearing impaired, and she starts them off with chicken bits and then progresses to a clicker, completely eliminating chicken, cheese, tripe, etc. (food bits) entirely by the time they’re 4-5months ago. At 6-months, they go to the proper puppy training facility where they’re accessed. Molly is semi-trained with a clicker. She’ll certainly come running with one click …. unless she’s chasing a squirrel or a pigeon. :D Molly wants her walkies; time to empty the dog. Wow, these look delicious, but I never seem to have much luck when I try to make homemade treats for my dogs. Something always seems to go wrong. Either I don’t cook them long enough, I cook them too long, or I just don’t get the ingredients right. I was wondering if I have to worry about the parmesan upsetting my dog’s stomach, because of the milk. Can a dog be lactose intolerant? Hi James, I wrote this quite a while ago when my dog was younger and his treats were useful for training purposes. You know your dog and what she or he csn eat safely. I no longer make treats for my dogs as they are happy with their regular food which is low in fat and I reward them with their normal kibble if they need rewards amd give them less in their main meal.